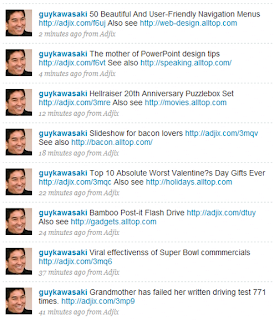 Twitterers, Please Help: Why Does Guy Kawasaki Think It’s Important For Me To Know About A Slideshow For Bacon Lovers? First an apology to Guy, I’m a great fan of yours. I’ve read many of your books, follow your blog(s), read and read your articles. I do this because, more often than not, you have interesting insights and something meaningful to say. Please excuse me for using you as an example about my struggle and confusion with Twitter (also, while we haven’t met, I sense you have a sense of humor). Guy’s a smart guy (sorry, I couldn’t help it), so clearly there has to be something significant about bacon—he reached out to me 18 minutes ago. 22 minutes ago, he knew that I wanted to know about bad Valentine’s Day gifts, and 2 minutes ago, he thought I would be interested in beautiful navigation menus. Guy is all about creating meaning….so I’m trying to figure this out and really struggling. Can someone help me? What am I not getting? The Future Of Selling, It’s Social—Or Is It? Stop Wasting Your Time On Social Selling! I ended up cutting Guy from my followed list. Signal to noise ratio was way to high. Might as well read Digg. I think the issue is with as many followers as he has, he feels some obligation to pass on every semi-interesting web morsel he sees. Fine if that’s what you are looking for, but not for me. I’m trying to trim my list to people I find genuinely interesting, primarily people reporting on clean tech and entrepreneurial issues. Lot’s more to trim, but I’m getting there. I’ve found that even with 360 people I’m following, there is no way to keep up with the traffic. I can’t believe with 40K followers Guy can have any kind of meaningful discourse with his followers. At least not many of them. Geoff: Great to hear from you, it’s been a while since we have spoken. I like your observation about the signal to noise ratio. Unfortunately, it seems with each generation of “new media” the volume of noise seems to increase exponentially — reducing the value of the tool, unless you find filters. Then that defeats the purpose. Think back to each successive generation of marketing tool and how they have been abused, lowering the value of the tool. Just go back to some of the original direct marketing. Most of us have experienced significant increases in volumes of direct marketing, now virtually synonomous with junk mail. At the same time, we have seen dramatic delines in response rates for direct marketing. In less that 10 years, rules of thumb for a well designed tested message have plummeted from a few percent (bad at that) to fractions of percent. Like wise with email marketing. Most well contructed email marketing program–to opt in lists only–are now filtered out, lost in the noice of spam. Only with email, the technology has enabled the volume to be 1000’s over the equivalent direct mail—so the noise in the channel is overwhelming. Now we move to the new social media tools, still in the early stages of development, and the volume of junk has gone up yet again. Standing out with a meaningful message is increasingly difficult. The promise of these media is to attract new customers — more knowledgeable customers, and to leverage permission based marketing. However, the noise and volume is defeating the value of things — and imagine we are still in the very early stages of adoption of this tool. Thanks for the post, it’s great to hear from you again. David, Good to “talk” with you too. I do think that some of the social networking tools do have the potential to work great as filters, if used carefully. I’m pretty “open” with my networking on Twitter, moderately open on Plaxo/Linkedin, and very tight with Facebook. I keep Facebook to real life friends only. Everyone on there is someone I know and like. And the news feed on FB has the best signal to noise ratio for me, and I spend the most time on there. Someone posts a story on Twitter, I may look. A news story gets posted on FB, and I’ll nearly always open it. In any case, I think tools like Delicious,Friendfeed,Reddit, Twitter and others, if used carefully, could be powerful in helping “filter” the net. The secret becomes controlling the network that influences what you see. That’s what I’m working on with Twitter. Sort of like having friends or people of similar interest check you snail mail or email, and trusting them to make sure you see the things that you find interesting! Wow Geoff, great comment. I have a lot to learn, may call you for a tutorial and catching up soon! Well done. When I tried to share my thoughts about Guy’s approach to engagement, I overlooked the humour angle and was promptly blocked (but not until The Peg intervened and told me how bad it was for me to disagree.) I’m now blissfully free of that stress and building relationships the old fashioned way, earning them.